50 ml jar - From Ischia Thermae born cosmetics strategy facing effectively the signs of aging: Anti-aging face thermal cream with glycolic acid specifically formulated to combat the free radicals, the main cause of skin aging and to give new energy and vitality to the skin. Anti-aging face thermal cream with glycolic acid, specifically formulated to combat the free radicals, the main cause of skin aging and to give new energy and vitality to the skin. Morning and evening, after cleansing and Thermal Water Tonic, apply to face and neck, avoiding the eye area. Massage gently until completely absorbed. 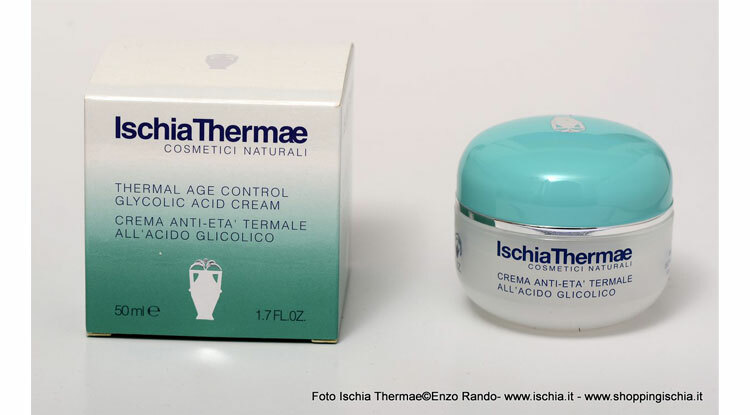 To a successful and comprehensive anti-aging treatment used in combination anti-aging eye thermal cream of Ischia Thermae.